So Lonely in Gorgeous: Dry Martini, Anyone? 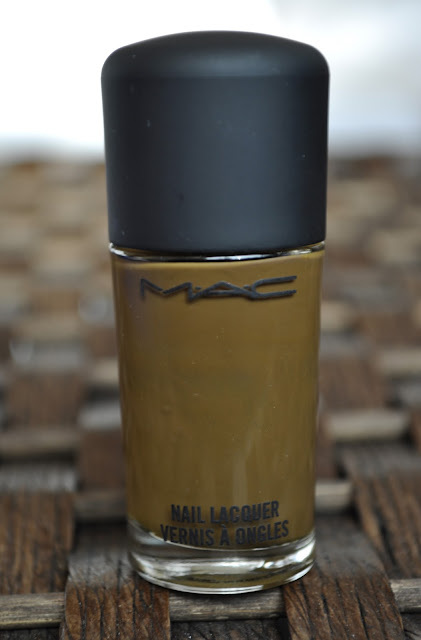 Today's Monday Mani is Mac's Dry Martini (Wow, so many M's). Please pardon the condition of my cuticles and nails, I was sick for a week, broke two nails and out of frustration, decided to cut them super short. Dry Martini isn't the easiest lacquer to work with, taking four coats to achieve the same color as in the bottle. Although this polish is a bit troublesome when applying, I do love the finished color, reminds me of a spanish olive...ummm, getting hungry now. Do you have any nail lacquers similar to Dry Martini?